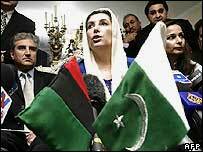 Ex-Pakistani PM Benazir Bhutto has said she is "optimistic" of a power-sharing deal with President Pervez Musharraf. She said conditions over an amnesty on corruption charges against her had been verbally agreed with officials. She said her party did not expect to join a boycott of a parliamentary vote on Saturday, which is expected to see Gen Musharraf re-elected as president. Ms Bhutto has pledged to return to Pakistan from self-exile on 18 October to fight general elections in January. She left Pakistan before Gen Musharraf took power in 1999. A draft accord, which Ms Bhutto has approved, would be issued by Gen Musharraf on Friday, AFP news agency quoted Pakistan officials as saying late on Thursday. The draft national reconciliation document grants an amnesty to Ms Bhutto, paving the way for her return to the country and to Pakistani politics, AFP sources said. Earlier, following talks with her opposition Pakistan People's Party (PPP) in London, Ms Bhutto said: "We are optimistic today, but I cannot say everything is finalised. "Gen Musharraf has said he wants national reconciliation. We want that too. The nation should move from the past to a better future." She said there had been "hectic negotiations and discussions and assurances" during which the terms for a written document, or ordinance, were agreed. Ms Bhutto said: "If the national reconciliation ordinance is accordingly worded, we expect there will be an understanding on a transition towards democracy." She added that if the deal was completed she would not carry through a threat to withdraw the PPP, the country's largest party, from parliament. Such a mass resignation threatened to undermine the credibility of Saturday's vote. "We will either contest the elections or we will abstain from the voting," she said. 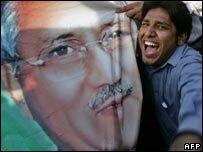 But Ms Bhutto made clear that PPP members would not be voting for Gen Musharraf as he was "a uniformed president". Ms Bhutto had demanded that Gen Musharraf step down as head of the army. Correspondents say that his pledge to resign and be sworn in as a civilian if re-elected has been enough to reassure Ms Bhutto. Scores of opposition MPs have resigned from Pakistan's national parliament and provincial assemblies in protest at Saturday's election. They insist that Gen Musharraf is ineligible to stand while also remaining army chief. In Islamabad, Pakistan cabinet minister Sheikh Rashid Ahmed said the government was close to an agreement on power-sharing and that "things are going in the right direction". In addition to the amnesty, Ms Bhutto wants the president to give up his power to sack the prime minister. She also wants the repeal of a law banning anyone from being prime minister for more that two terms. She and political rival Nawaz Sharif have both been premier twice before. Observers say Gen Musharraf wants a power-sharing agreement with the PPP, the country's largest party, to give him more popular support. He will also hope for PPP support after the general election in which the ruling party is expected to fare badly, they say.